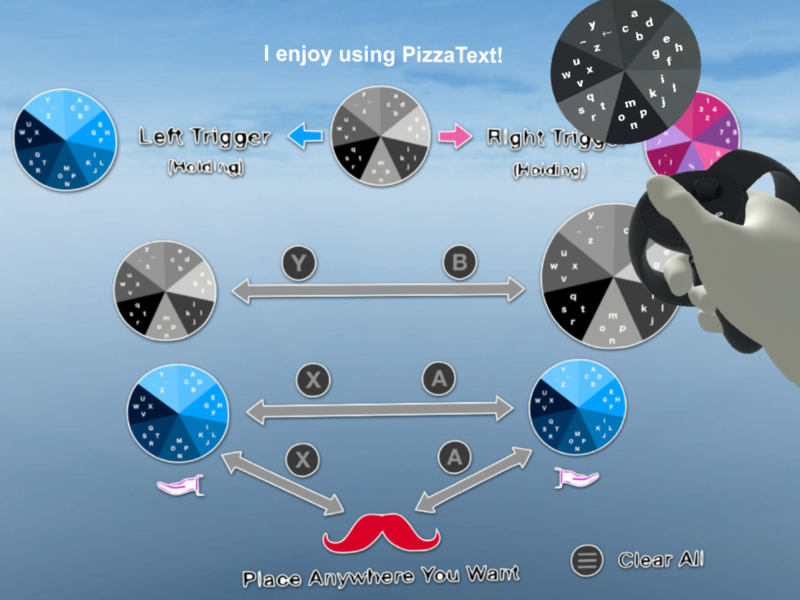 We present PizzaText, a circular keyboard layout technique for text entry in virtual reality (VR) environments that uses the dual thumbsticks of a hand-held game controller. A user can switch between key levels, scale the keyboard to different sizes (even in fairly small size), and place it in customized places. Our technique makes text entry simple, easy, and efficient in VR head-mounted display (HMD). We are sorry that we encountered some problems when uploading the video files to Unity Connect. Thus we uploaded elsewhere for downloading. Thanks! The results have been published in IEEE Transactions on Visualization and Computer Graphics (TVCG).